A workhouse was established in Coppul in around 1732. It was located at the east side of Preston Road, opposite the end of Chisnall Lane where the Alison Arms pub now stands. Brindle had a workhouse from 1740 (Hitchcock, 1985). A parliamentary report of 1777 recorded a workhouse in Brindle with a capacity of up to 60 inmates. The workhouse stood at Top o'th' Lane to the south-west of Brindle at the junction of Denham Lane (formerly known as Workhouse Lane) and Holt Lane. The building was converted from a former Catholic chapel which in 1854 was described as a "large whitewashed building". Until 1816, the workhouse was also used to accommodate pauper lunatics as well as the destitute. The earliest workhouse in Chorley itself appears to date from 1788 when one was erected at the east side of Eaves Lane. Chorley Eaves Lane workhouse site, 1849. Prior to that the town had made use of a workhouse at Westhoughton. Workhouses were also established in Hoghton and Leyland. County of Lancaster: Adlington, Anderton, Anglezark, Brindle, Charnock Heath, Charnock Richard, Chorley (3), Clayton-le-Woods, Coppul, Croston, Cuerden, Duxbury, Eccleston, Euxton, Heapey, Heskin, Hoghton, Leyland, Mawdesley, Rivington, Ulves Walton, Welsh Whittle, Wheelton, Whittle-le-Woods, Withnell. The population falling within the Union at the 1831 census had been 33,575 with parishes and townships ranging in size from Welsh Whittle (population 147) to Chorley itself (9,282). However, the building was back in use as a workhouse in 1842 when the Preston Chronicle carried an advertisement for a new Master and Matron at a combined salary of £30. The result was presumably unsatisfactory since a similar advertisement appeared the following year with the joint salary now raised to £40. Brindle Master & Matron ads. Leyland workhouse had closed by March 1846, when the site was being put up to let. Croston workhouse was sold off in November 1851. It was described as occupying a site of half an acre, with the three-storey building having five rooms on the ground floor, including a weaving shop containing fourteen pairs of looms. 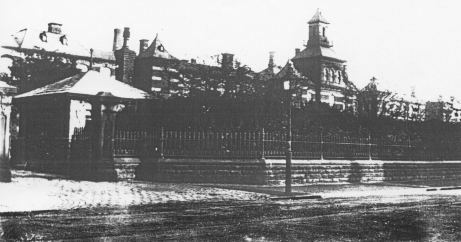 By the 1860s, Croston and Leyland had closed, with Eaves Lane used for the temporary accommodation of invalids and vagrants, with the majority of the union's paupers being housed at Brindle. A Poor Law Inspector's report in 1866 described Eaves Lane as 'very old and ill-arranged' and Brindle as 'a ruinous old place'; quite unfit for the purpose for which it used'. In 1870-2, a new Union workhouse for 320 inmates was erected on Eaves Lane at a cost of £25,000. It was designed by JJ Bradshaw. Its location and layout are shown on the 1905 map below. It comprised a porters's lodge and vagrants' accommodation at the site entrance to the north, a T-shaped main block, and male and female hospital pavilions to the rear. Chorley workhouse from the north-west. 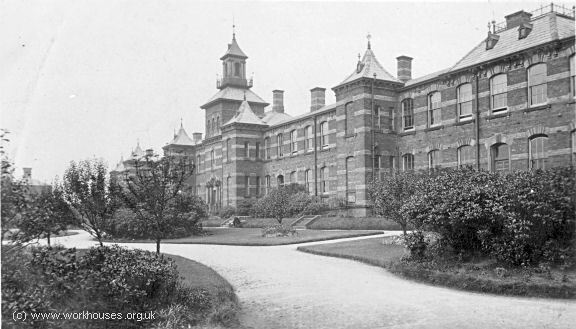 The workhouse later became Eaves Lane Hospital providing mental health care. The site is now occupied by housing. 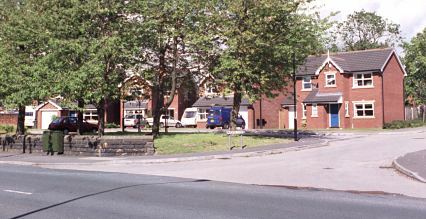 Chorley former workhouse site, 2001. By the 1920s, the Chorley Union had opened a children's cottage home known as 'West View' on Stump Lane, Chorley. The home could accommodate 14 children. Lancashire Record Office, Bow Lane, Preston, Lancashire, PR1 2RE. Holdings include: Board of Guardians' minutes (1861-2, 1901-30; Admissions and discharges (1926-52); Lists of paupers (1899-1900); Punishment records (1872-1948); Register of mechanical restraint (1901-48); etc.